You can’t always recruit the expats you want for an emergency response. Maybe the right skills can’t be found; visas aren’t available; people need a break; expats don’t speak the language; lots of reasons. The solution is often right in front of you: experienced national staff, often working for national NGOs. Why would you hesitate in recruiting them? 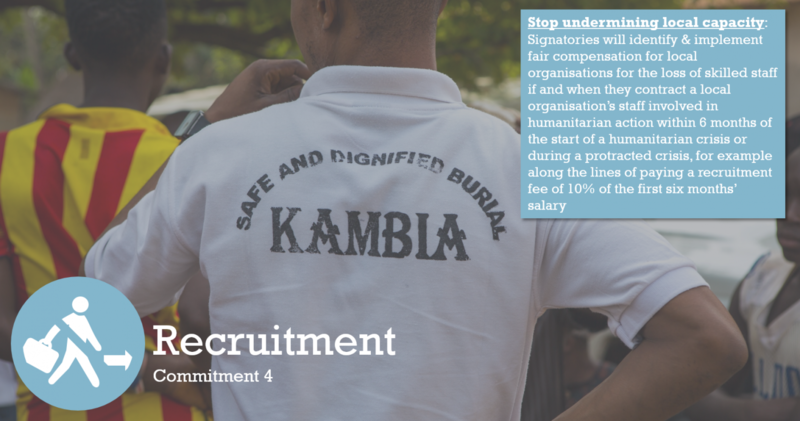 Commitment 4 of the Charter4Change doesn’t say an INGO, a Red Cross or the UN shouldn’t recruit staff from local NGOs; it is encouraging us all to prevent the negative impact of doing so, to prevent reducing the short- and long-term capacity of the national NGO. Such recruitment affects individuals as well as organisations, but there are ways to reduce the impact. On individuals, I remember well the conclusion of a conference organised by Africa Humanitarian Action which I attended in the early 2000s: National NGOs didn’t want to lose their staff to INGOs, RCRC and UN, but it wasn’t for the NGOs to prevent those staff furthering their career and earning more for their families. We all want to put affected populations at the centre of our work and national staff are often a part of the affected population. Even if they aren’t, then good management practice, as well as humanity, suggests that individual staff interests should come before those of both NNGOs and INGOs/RCRC/UN. A second factor for the individual is job security: what happens after the INGO’s emergency work is finished? Programmes can be developed to support laid-off staff  but are there no locally-agreed arrangements which can be put in place at the time of the emergency: for example secondments or genuine partnership working? On the role of organisations I have read the draft Pledge for Change circulated at the WHS Geneva Consultation by a group of Southern NGOs. It notes as one aim: ‘Establish a System of Compensation for loss of SNGO staff to INGOs’. It suggests this in the context of SNGOs taking on more of the direct response, and therefore needing to retain experienced staff to spend, effectively and cost-efficiently, the increased percentage of pooled funding they are requesting. SNGOs therefore need to offer the processes, values and culture a worker seeks in an employer, and provide decent promotion prospects, pay and good management. Otherwise they will lose their staff. Any organisation can be a bad employer; all organisations should be a good employer. It is one thing for INGOs to be recruiting from SNGOS (a pull factor), another for SNGO staff to be deserting SNGOs (a push factor, whatever the incentives for joining an INGO) because they are poor employers. In the latter case compensation would be less easily justified. SNGOs should encourage independent researchers to conduct exit interviews of recently-departed SNGO staff: if staff departures are about push, as much as pull, then part of the solution must lie with the SNGOs. SNGOs, though, have less funding to spend on pay and on their internal processes. There was a non-financial arrangement put in place at the time of Cyclone Nargis in 2008: the Myanmar INGO Coordination Office promoted agreements between agencies that a new, suitably skilled staff member should be recruited before staff of a national NGO could move to an INGO or the UN. All international organisations and their donors commit to achieving their mission first and foremost by strengthening national and local capacity. International organisations compensate national and local organisations from whom they hire staff. National and local organisations invest this compensation in competitive pay and training. The big question is where the funding comes from for the compensation. From the package an INGO would have had to offer to an expat? From a line in the funding proposal called ‘Strengthening local capacity as per (imminent?) WHS commitment’? You can let local actors respond to the emergency – ECHO’s policy paper for the WHS offers guidance. You can partner with an SNGO and help strengthen their capacity, before an emergency – or do it nationally and collectively, on the model of the START Network’s Surge Project. Work with other INGOs in-country, before the emergency, to agree policy or practice – perhaps a variation of the Myanmar example would work. This conversation was first written up by the author in http://www.chsalliance.org/files/files/CHS-Alliance-HAR-2015.pdf, (page 94), addressing ‘poaching’ as part of a wider look at people management in the sector.